When talking about A&W, what will be the first thing that pops into mind? For me, the luxurious and tasty RB Floats (was known as Root Beer Float)! What about the delicious Waffle and Beef Coney (was known as Coney Dog)? Which one that pops into your mind? Or was it Rooty, the ever smiling and happy bear mascot of A&W? A&W (Malaysia) Sdn Bhd is the first ever quick-service restaurant (QSR)/ fast-food chain opened in Malaysia. The restaurant at Batu Road, Jalan Tunku Abdul Rahman was officially opened to the public on 31 October 1963. 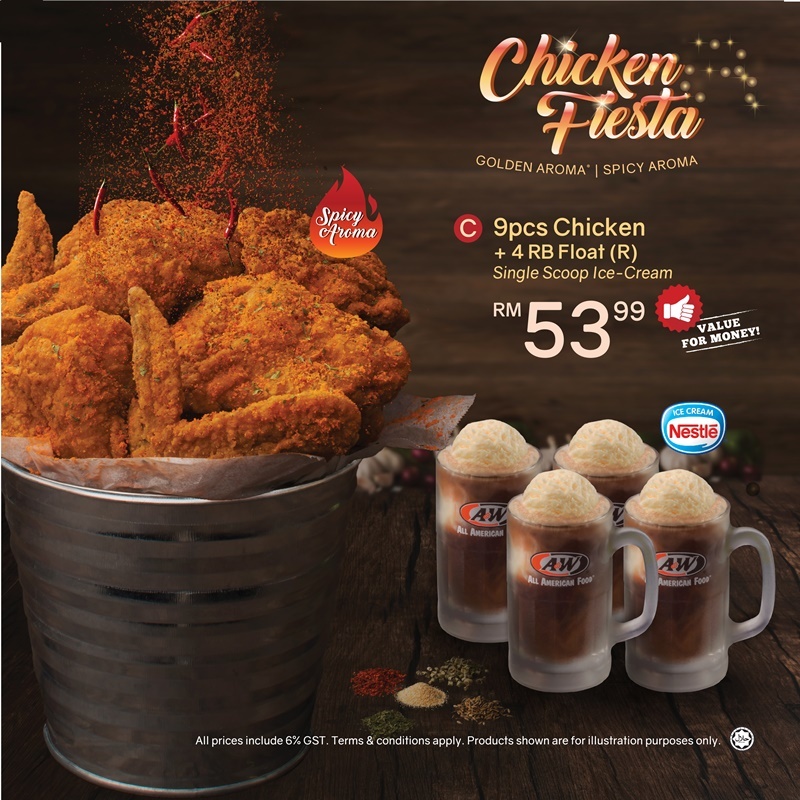 Apart from the above-mentioned delicious servings at A&W, other hit-makers are the Golden Aroma Chicken (GAC) and the Spicy Aroma Chicken (SAC). The freshly breaded chicken with special herbs which cooked to golden perfection and still preserved its juiciness and tenderness is what differentiates the chicken at A&W from the others. 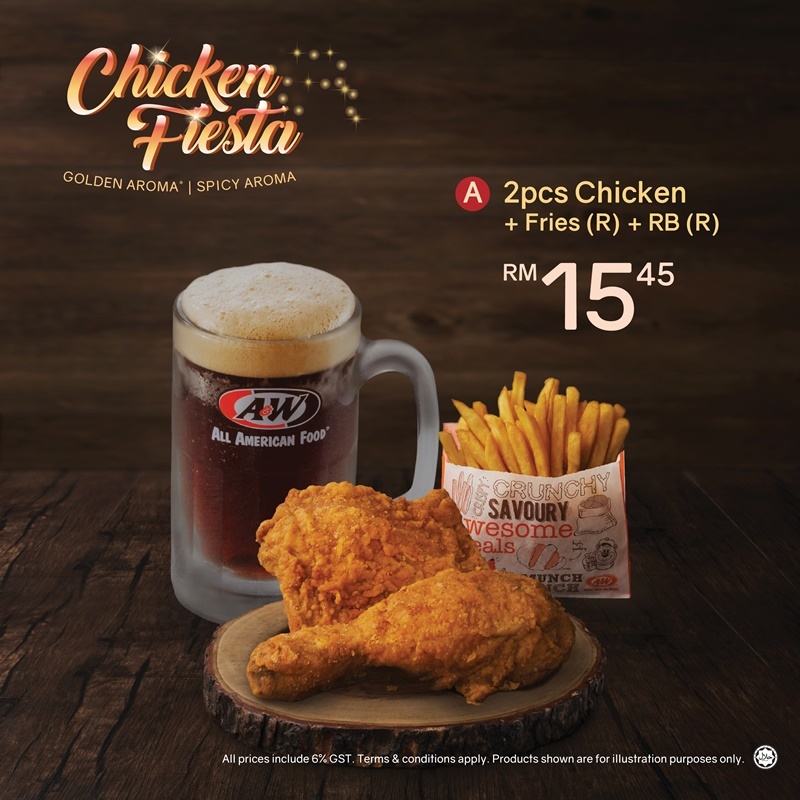 And now, started last 7 November 2017, A&W reintroduce the much beloved fried chicken to the public, this time in the fiesta and grand style: Chicken Fiesta. 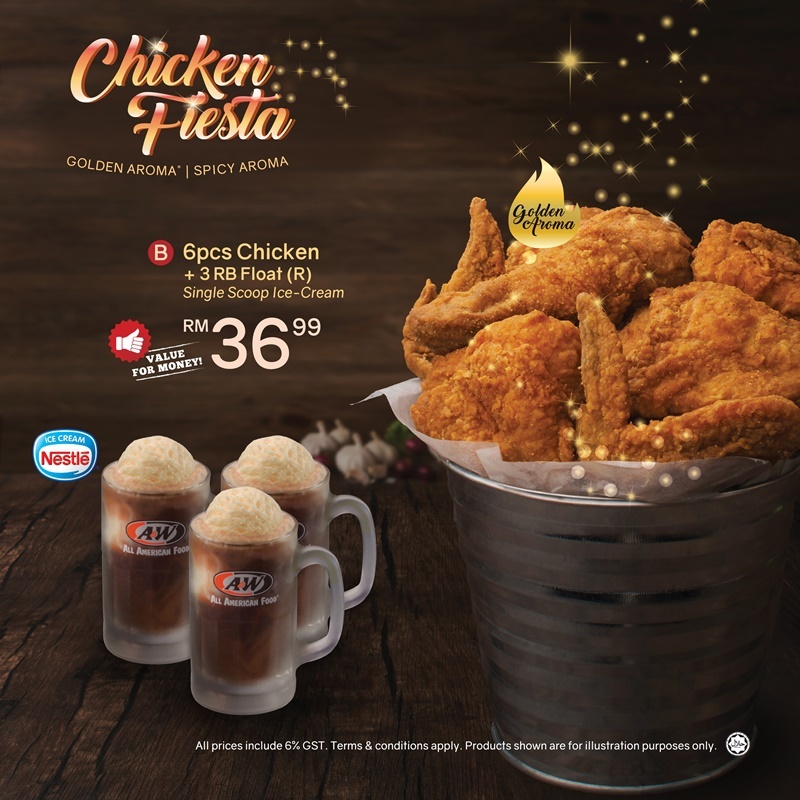 Now we can order the much beloved GAC & SAC with RB Float in combo - 2 pieces, 6 pieces and 9 pieces of chicken. 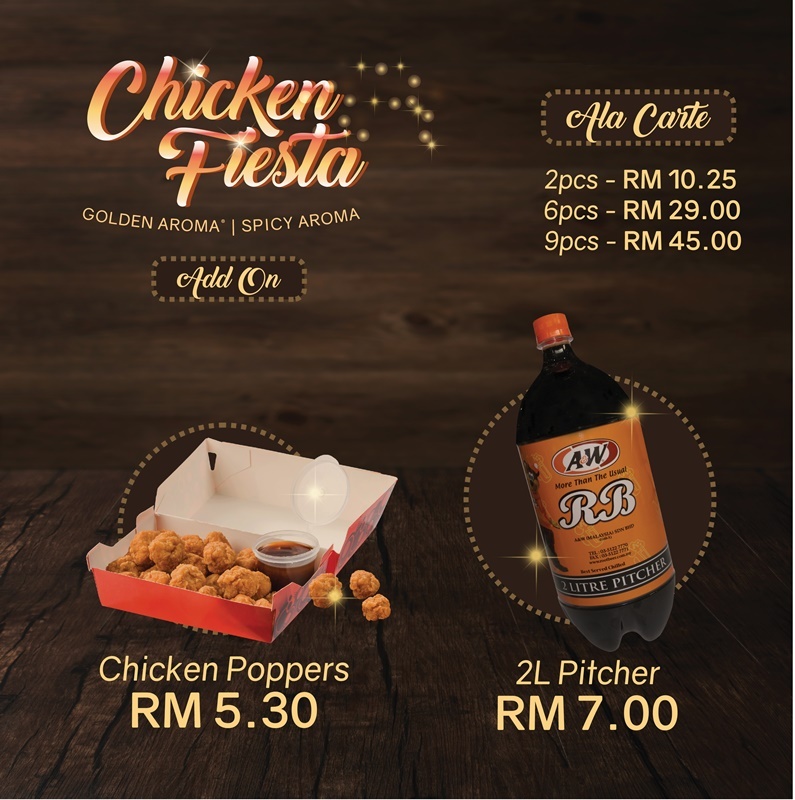 The latest to join the Chicken Fiesta family is Chicken Poppers! Just add on to the merriment! I was invited for the product review of the combos and man, did it really bring back the memories. Who went to the A&W in PJ back then, please holler ok! I was among those that love to visit the branch just to have the RB Floats! Did I just see you gulping at the sight of RB there? You want to bring the RB Mug home and prepare the RB in the comfort of your home with the loved ones? 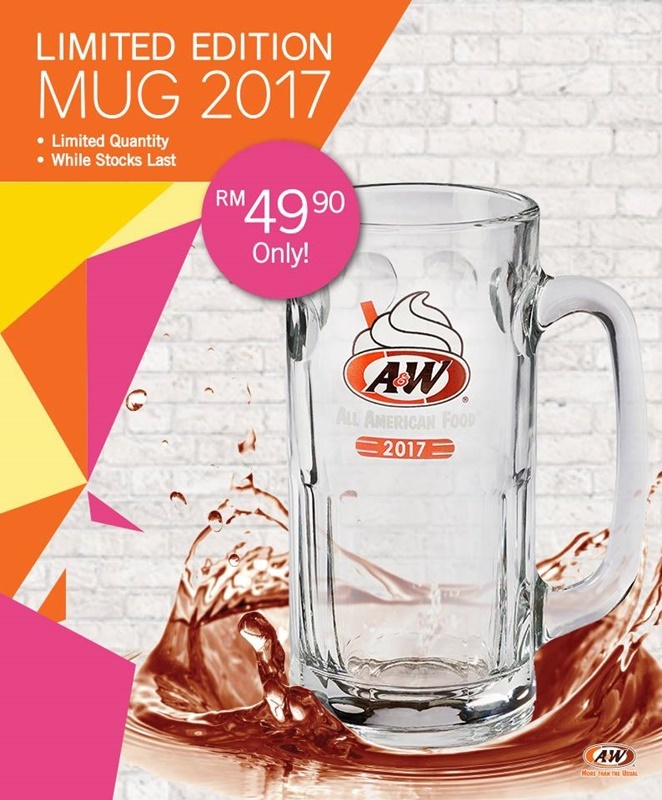 Just head on to the nearest A&W and get yours today at only RM49.90. Hurry because it is of special edition and very limited too. Long time never treat myself with a&w. I love their fried chicken and root beer float. Ayam yang spicy tu memang sedapp..terasa kepedasan ayammnya..air rb tu mmg tak sah lagi kepowerannya.. Ayam dan rb bergabung meletop top topp..hehhee..
Root beer float is indeed their classic! Kuantan doesnt have a branch so I haven't had it for ages! Susah nak jumpa restoran A&W sekarang. Dulu duduk PJ rajin juga pergi. Sedapnya tengok ayam tu. Boleh share dengan keluarga dan rakan2. Mesti lagi jimat. Tengok gambar ayam goreng pun dah terliur & nampak sedap. tak sabar nak cuba A&W ni. Ya ampunn..sedapnya nampak spicy chicken tu tapi kat sini takde A&W.. Rindunye dengan float dia..
nak kena balik kampung ni, baru dapat jumpa A&W. Lama dah tak singgah a&w ni. Suka kat float dia. Nanti cuti-cuti boleh bawa anak-anak la. Nak menang RM mug tu juga la.. cantik. my childhood meal. i haven't seen any marketing campaign for A&W for such a long time.. i hope now they'll revive their glory days coz i really like them! Tuesday, 14 November, 2017 delete This comment has been removed by the author. Omg pls tell me it's real! I miss the flavour of the chicken back in A&W PJ drive Thru... It's my childhood place... Makes me wanna go grab some of these for myself now! I miss their Root beer. Will try their chicken too. OMG! My childhood memory~~~~ The float is my all time favourite! Root beer float is my all time favorite kalau makan di A&W. OMG I love A&W especially for their Twisted Fries and The Root Beer Float!! Not only that I also craving for Fried Chicken so much too!! Omg, chicken!!! I'm a fan of fried chicken!!!! 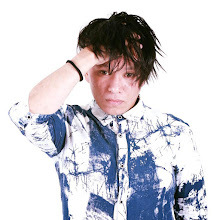 Your picture makes me hungry now and definitely will go grab a box of chicken for my dinner tonight. Lama tak dengar A&W. Air dia lagend betul. Baguslah deorang buat menu baru macam ni. I'm so glad A&W is back! Been seeing it around but haven had time to visit it yet! I miss their float! Kemain eh. A&W pun sekarang dah makin bergerak dengan penjual ayam goreng. Chicken poppers dia memang akan jadi fav I ni.